Keeping in mind the ever-evolving requirements of our valuable clients; our firm is instrumental in providing an extensive assortment of Goat Farming Shed. We are a unique name in this industry to provide our prestigious clients an exclusive range of Goat Farming Platform Shed. 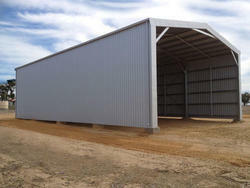 Nisa Pre-Engineered Metal Buildings Pvt. Ltd.
Cattle Shed not only protected the animal from the low temperature during the wintertime but also during the hot summer months. It helps protects animals from High Infra Red rays and hot.